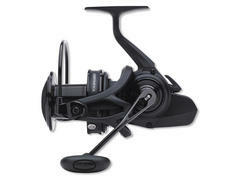 With the Emblem 35 SCW DAIWA relaunches a legendary Big Pit reel for carp fishing. Especially the innovative Slow Cross Wrap line lay (SCW) cares for frictionless casts and thus optimum casting distances. The extra-thick and distortion-proof stainless steel axis offers highest security at the fight, particularly over short distances, when large specimen have to be directed to the landing net. The Emblem reels from DAIWA are very popular among surfcasters since many years, since they stand for highest durability and reliability. The Emblem Surf 35 SCW QD now for the first time offers the new SCW (Slow Cross Wrap) system, which enables a more even line wrap for less friction resistance and optimized casting distances. The extra-strong and distortion-proof stainless steel axis offers the necessary security, to direct even large specimen during the fight without making compromises and to cast also heavy leads. The Emblem 25 is based on the successful and well-known Cast'Izm 25 QD and convinces by its silky-smooth running and its low weight. 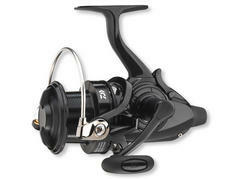 The Zaion reel body ensures a robust housing of the drive and contributes to the low weight. 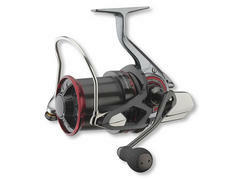 The 25mm spool stroke is unique and allows the design of a small and compact body with long spool. As a result you get the function of classic Big Pit reel with a remarkably lighter reel body. Compared to the previous model, the new Basia 45 SLD QDX has been completely revised and now features many details especially for the European market. For example the spool of the new Basia 45 SLD QDX has been milled deeper to enhance the line capacity – the new spool offers space for 300m 0.35mm! The main shaft is made of stainless steel and is considerably tougher than at the previous model. Of course the 17' Basia 45 SLD QDX is manufactured in our Japanese factory according to highest quality standards. The Basia 45 SLD QD has been completely revised and now features many new details especially for the European market. For example the spool of the new Basia 45 SLD QD has been milled somewhat deeper to enhance the line capacity – the new spool now offers space for 300m 0.35mm! The main shaft is made of stainless steel and is considerably tougher than at the previous model. 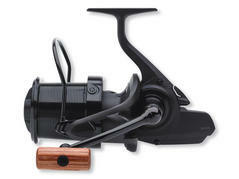 The decent black design with reel wood handle knob makes this reel a real highlight! 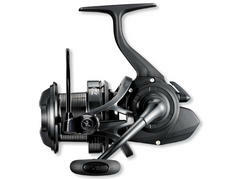 The Tournament ISO 5000LD QDA BE has been completely redesigned by DAIWA’s engineers to perfectly meet the particular expectations of the European market. 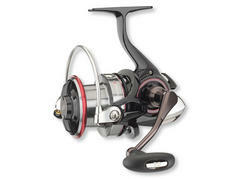 By using DAIWA’s exclusive Zaion material for the reel body, the reel weights could be decreased significantly. The Zaion material enables an absolutely solid housing of the drive and cares for optimum retrieving power. A concept on its ways to success. 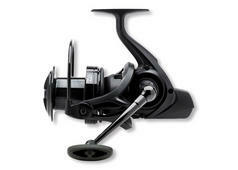 The especially developed 25mm stroke spool in combination with the large spool diameter enable the construction of a small and compact body in combination with a long spool – like this you get the function of a classical Big Pit reel combined with a considerably smaller and more lightweight reel body. The Cast'Izm BR 25A combines nearly all outstanding technical features, which have been developed by DAIWA over the last years. The 25mm spool stroke in combination with the conical aluminum long cast spool enables the construction of a compact and lightweight reel with a small body, which additionally features the excellent casting properties of a Big Pit reel. 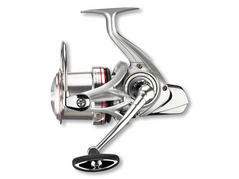 The Emblem BR 25A represents Bite N' Run reel construction at its finest! The concept with a 25mm spool stroke enables the construction of a compact and lightweight reel, which combines the longcasting-benefits of a Big Pit reel. 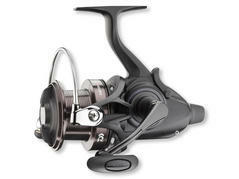 Due to the lighter weight you even can cast more precise and controlled compared to heavier Big Pit reels! The big spool diameter enables extremely long casting distances and – in combination with the transmission of 5.3:1 – a line retraction of more than one meter! The legendary Basiair reel has been further evolved by our Japanese engineers – now featuring the MagSealed concept. The combination of Zaion and magnesium is the perfect basis for the construction of extremely lightweight but nevertheless strong and distortion proof reels. The MagSealed construction cares for a perfect sealing of the reel body via the axis. Since like this no dirt particles can enter the gear, a permanently soft and smooth running is guaranteed.